Anyone who knows me for even a short period of time knows that I am a huge Cincinnati Reds fan. I love baseball, and as someone who grew up in Cincinnati (alas, after the Big Red Machine), I have always followed the Reds. One of my favorite players for the Reds is their first baseman, Joey Votto, who is one of the best hitters in the game (let’s not talk about his defense and baserunning skills). One thing Votto is particularly known for – and a big reason I enjoy him as a hitter – is that he doesn’t swing at pitches outside the strike zone. He takes pride in following Ted Williams’ advice to only swing at what you can hit. With this attitude, you can see Votto, more than other hitters, getting particularly frustrated when an umpire is calling balls outside the zone as strikes. This happened with a vengeance on Wednesday night, as home-plate umpire Bill Welke was a disaster behind the plate. As the game went on, it almost became a game to see how badly he would call balls and strikes. Now there is no question that Welke was wrong in his strike-calling. Also, there is no question that Welke had WAY too quick a trigger-finger in ejecting Votto. All Votto did was ask for time (something a batter is always granted), and Welke inexplicably refused to grant it to him. Then when Votto looked to his dugout for some support, Welke rung him up. Very bush-league by Welke. And yet Votto’s response was so beyond the pale that it was embarrassing. I watch most Reds games with my 12-year-old son (who loves Votto), and I immediately thought of what a bad example Votto was to my son. In my son’s Little League, even the slightest disagreement with the umpire results in quick punishment (usually benching), because as adults we recognize that young people need to control their emotions, respect authority, and treat every person – even an umpire who is obviously off his game – with respect. Votto clearly violated those principles. As a father I preach self-control to my son over and over. It is one of the primary virtues a young man needs in life to be successful (and I don’t mean simply success monetarily, but in all aspects of life). Being able to control our impulses is vital to a well-lived life. I understand that people can get caught up in the emotion of the moment, especially in a high-pressure situation like a professional sporting event played in front of thousands, but there is absolutely no excuse for Votto’s (over-)reaction. 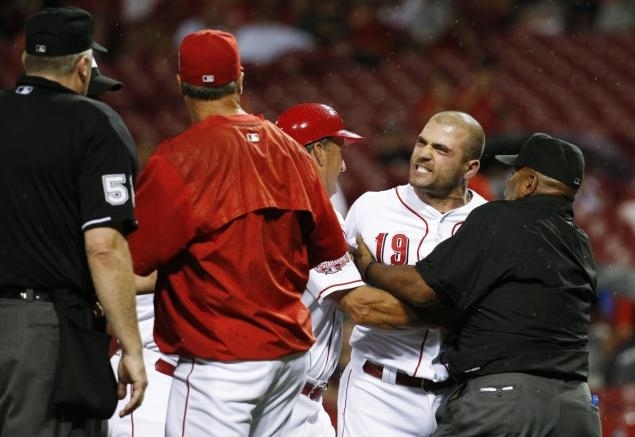 When a similar incident occurred earlier in the season (yes, he’s done this before) Votto made a sincere apology; hopefully he will do so again, but also make a firm amendment to avoid such boorish behavior in the future.